Hi ya’ll. Are you getting ready for Ursa? The winter blizzard that’s already hit New Mexico, Colorado & Wyoming and is sweeping through the Midwest? Crazy. Well, here’s a great recipe to make and cook long and slow while you’re waiting out all that snow. Sweet & Sour Country Style Ribs. Make your Sweet and Sour Country Style Ribs in the slow-cooker, in your Instant Pot slow cooker, or just lovingly braise them in the oven. Add a vegetable of your choice and be sure to make mashed potatoes. Lots & lots of mashed potatoes for all those lovely juices. Sweet and Sour Country Style Ribs are adapted (I jazzed them up) from Martha Stewart, and she has a pretty cool method of cooking them. Rather than crisscross the ribs (as I’ve always done, like in this recipe) stand the ribs up vertically, bone up, in the slow cooker. As you can see, they turned out beautifully; they held together and were absolutely tender throughout, without literally falling off the bone. I’ll be stealing that little hack for other recipes. After the first time I made these Country Style Ribs I wanted a little more flavor, so I added a rub just for more interest. My fave is my own Sweet Heat Rub but the folks especially liked the ribs rubbed with my Cajun Blend. You can use one or the other or whatever you have on hand – or no rub if you prefer…It’s still only a few minutes prep time. This was the first time I’ve used the Instant Pot Slow Cooker and it worked out very well. While I didn’t do any kind of “testing” it seems to me that the Instant Pot slow cooker was just a little slower than a regular slow cooker. I cooked the ribs 6 1/2 hours and I usually go about 6 hours in the regular slow cooker, but that can vary a bit depending on the amounts and how thick the ribs are. If you’re not familiar with Country Style Ribs, they’re an extremely economical cut of meat, and they often go on sale in larger “family packs.” Since they need to be cooked low and slow, I usually cook them all rather than dividing for our smaller family because the leftovers are fantastic, too. I save some of the juices and a rib or two for another recipe later in the week, Pork & Mushroom Ragu. Rub the pork chops with the spice blend or rib rub, or if not using, sprinkle with salt and pepper. In slow cooker, whisk together ketchup, sugar, vinegar, mustard powder, cayenne, 1 teaspoon salt, and 1/2 teaspoon pepper. Add ribs to slow cooker, and toss with sauce. Arrange ribs, bone side up, in a single row. Cover; cook on high in the slow cooker for about 6 hours or in the Instant Pot on high for about 6 1/2. If using a low setting, cook for 10 hours. Serve ribs drizzled with pan juices and, if desired, barbecue sauce. Note: If you prefer to cook in the oven, preheat oven to 350 degrees. Use a 5-quart Dutch oven or ovenproof pot with a tight-fitting lid and proceed with the recipe, adding 1 cup water. Cover; bake until ribs are tender, 2 1/2 to 3 hours. I’m linking my recipe up at Fiesta Friday, hosted this week by Jhuls @ The Not So Creative Cook and Elaine @ Foodbod. 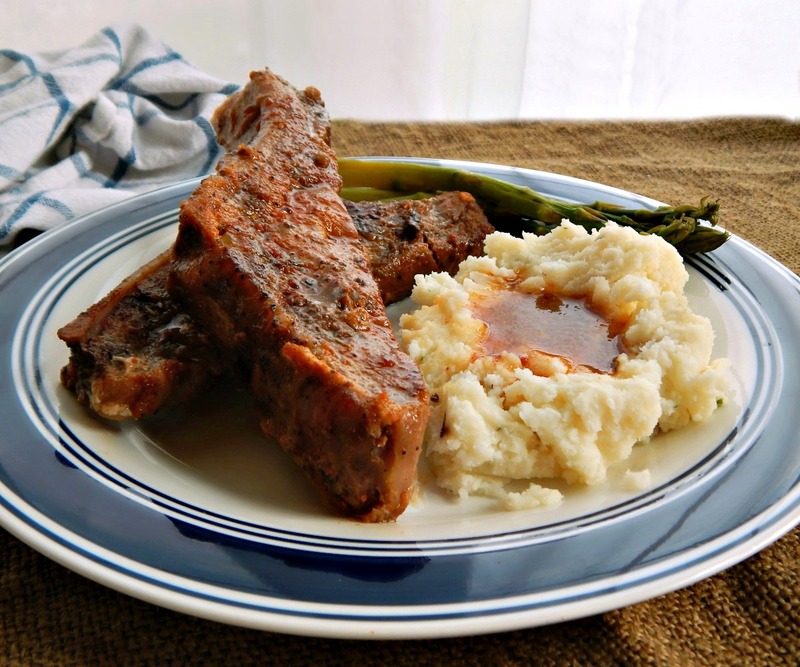 This entry was posted in Click here for Bargain Meals, Click here for Fabulous Food Posts and tagged Bargain Meal of the Week, country style ribs, German, Instant Pot, Martha Stewart, Pork, rib rub, Slow Cooker. Bookmark the permalink. Replying late to everyone…it’s been quite a week here! And thanks, Rhonda. Mashed potatoes and gravy (or jus) just makes my knees go weak. Ok, slight exaggeration, but I do love them. Guilty pleasure? Couldn’t agree more on the gravy– and yours is so rich and dark. And– What was your crazy week?? Hope your Dad’s OK. hugs from here friend! Thanks, I didn’t really “do” anything to it, just defatted a bit. It is always crazy at the folks…everything takes so much energy. Loved the addition of cider vinegar in this and would like to try cajun rub. Never tried Cajun spice with Ribs. Beautiful share. Now, I am very much interested to get Instant Pot. 😀 This sounds lovely, Mollie. Thanks for sharing at FF party. Thanks, Jhuls! I’m having a lot of fun with it. I’ve made all kinds of things, some needed a lot of tweaking before they’re blog ready, but I’m mostly impressed wiht all the frittatas I’ve been making! And the risotto. 🙂 I DO love having a new toy! I really need to buy more country style ribs! These look so good! Love the flavourings here. Anything with brown sugar and cider vinegar has to be delicious! I don’t often cook ribs but definitely keen to try this recipe. The bit of rub just takes it to the next level. 🙂 I can’t wait until it’s reliably warm enough to barbecue or grill, here. Whoever heard of a blizzard this late in the year! The apple cider vinegar is a brilliant addition! I think a slow cooker (or hot pot in your case) is about the only way to go with country ribs, they are a tough cut but very affordable. I am SO glad Ursa missed Oregon. We enjoyed a lovely, sunny 65-degree day yesterday. I got sunburnt working in the yard!